I don’t know how this album entered my consciousness, but I assume I read some review that raved about it. I had some familiarity with Vijay Iyer via some of his solo work and as a sideman with sax man Rudresh Mahanthappa. I always liked his complex, yet accessible style. Wadada Leo Smith is but a name to me. About all I knew was he plays trumpet and is associated with the jazz avant-garde. A Cosmic Rhythm With Each Stroke is quintessentially ECM. ECM is the most reliable jazz label for my ears. Always tasteful, generally quite and complex without making your head explode. Impeccably recorded and starkly beautifully packaging. That pretty much defines this album. The album opens with “Passage,” a Vijay Iyer song. 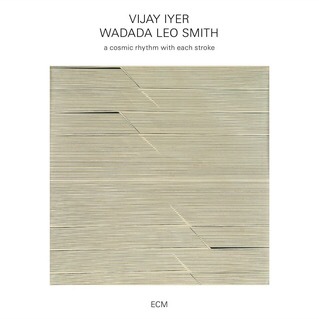 Wadada Leo Smith’s trumpet whispers over Iyer contemplative piano. I would not have thought a duo of quite piano and trumpet could deliver such a powerful punch. As mellow as Smith sounds there is an edge – a gentle hint of atonal avant-garde jazz. The song is a pure duo. Next is the titular suite in seven songs/parts/movements ranging between five and nine minutes. The suite was commissioned by The Metropolitan Museum of Art for its exhibition of the art of Nasreen Mohamedi (the album’s cover is a sample of her art). It was composed by Iyer and Smith. “All becomes alive” opens the suite as a conversation between Smith and Iyer as each takes solos. Smith start the conversation over an electronic drone from Iyer. Iyer responds with a gorgeous contemplative piano solo. Smith answers back with an equally gorgeous solo. Soon piano and horn are in a gently duet. Two voices respectfully weaving together. Iyer (I assume) adds some percussive effects. “The empty mind receives” opens with some gentle keyboarding answered by Smith’s muted trumpet. The song gets ever more adventurous. So like the song title, the song starts empty and then gains wisdom. “Labyrinths” has a gently chaotic feel as Iyer and Smith run around trying to find each other. The song gets less hectic, but retains its complexity. “A divine courage” starts out with a nearly silent electronic hum. Smith enters at about the minute mark with his rich tone and slowly solos for a couple of minutes with some occasional tasteful punctuation from Iyer. As the song progresses Iyer slowly asserts his voice without overshadowing Smith. “Uncut emeralds” begins with Iyer twinkling the right hand ivories. Smith pipes in with almost a sax sounding trumpet – he makes exquisite use of the mute. “A cold fire” starts with Smith sounding like twisted balloons. Iyer plays a busy and scattered piano. The song has a wonderfully chaotic feel. The suite ends with “Notes on water” which is almost a hymn. The final cut on the album was composed by Smith and is called “Marian Anderson” and is the most conventional jazz cut on the album. Smith plays in a gorgeous full tone and Iyer dances around the keyboard in an almost Keith Jarrett solo manner. This is the proverbial match made in heaven. Iyer and Smith mix so well together – the ultimate cocktail as it reveals unique flavors with each sip. The sympathy between these two artist is profound. It is quiet yet aggressive at the same time – it is the sound of great resolve. This a quite piece of music best listened to in a quite room so you can pick up the subtleties. The music travels from a whisper to a scream with the whisper being the best part. This is not music for everyone. Some will find it harsh and “out there.” But if you are willing to open your ears and mind you will hear a beautiful conversation by two enlightened friends. Listen carefully to the undercurrent of electronics that Iyer has going – get below the piano (but don’t miss out on the piano either). Fully absorb the many amazing sounds of Smith’s horn. Sorry no Spotify – ECM doesn’t do Spotify. Buy the CD – streaming at low qualiyt would really take the shine off this brilliant recording anyway.